Despite their important role, LHWs face several challenges that have potential to impact their performance. Studies have shown that while LHWs have sufficient technical knowledge regarding MCH practices, their ability to effectively transfer this knowledge to their target audience – married women of reproductive age and their families - needs improvement. Specifically, HCC found that LHWs often had inadequate resources and job aids which negatively impacted their ability to communicate effectively with community members. This was especially pertinent on the topic of family planning. Further, studies suggested that communicating family planning information with their clients was commonly perceived by LHWs to be a difficult activity. Consequently, HCC recognized a gap: LHWs required capacity strengthening to strengthen interpersonal communication (IPC) skills and enhance their job performance. To address this need, HCC developed the Roshan Mustaqbil (Bright Future) paper-based toolkit as a communication-focused capacity strengthening intervention. The toolkit aimed to improve the communication skills and interpersonal effectiveness of LHWs as they provided Reproductive, Maternal, Newborn and Child Health (RMNCH) counseling services to clients. This paper-based toolkit was later adapted to become a mobile health tool. The original paper-based IPC Toolkit was designed through a consultative process and incorporated a three-step problem-solving technique. This approach ensured that health workers carefully listened to and understood the core health issue, as well as behavioral barriers and facilitators when working with families to find appropriates solutions for their health needs. The original toolkit covered 22 health topics. To develop the application, HCC conducted a series of workshops with key stakeholders, including representatives from the Lady Health Worker Programme, Department of Health government, non-government organizations, UN agencies and development partners. Each of the two components of the app was developed separately given the differences in objectives. In 2016, to design and develop the mCounseling component, the HCC held a 10-day design period to assess LHWs’ existing workflows, specific capacity development needs and aptitude for the technology. The approach focused on meeting both the basic functional needs of the technology (i.e. Android based) and user requirements (i.e. limited text, entertaining content). In 2016/ 2017, the mLearning component of the App was developed during a two-day design workshop. This workshop allowed for a deeper understanding of the existing LHW training curriculum and the current practices of LHWs. This information was used to develop adult learning theory-based IPC content that highlighted key skills necessary for effective counseling during the three-step IPC approach. In addition, LHWs highlighted small group meetings as a potential area of growth. As a result, HCC developed additional content to provide guidance for counseling small groups (vs. one-on-one household counseling). OppiaMobile, the technology supporting Roshan Mustaqbil, is an open source mobile learning platform integrated with the Learning Management System known as “Moodle”. The core OppiaMobile functionality allows for systematic delivery, reliable access to content and easy management of health promotion content, video and quizzes. The initial deployment onto Android-based tablets or phones can either occur over Wi-Fi, computer cable connection or via Bluetooth. Once loaded onto the Android smartphone, this content can be accessed offline and used when no internet connection is available. If and when a connection becomes available usage data, such as quiz scores, are sent back to the server for near real-time monitoring by program managers. In addition, frontline health workers (FLHWs) can earn points and badges within the App by completing App activities. The points, together with the usage statistics, provide regular feedback illustrating how the App is being used by the FLHW. These analytics are posted and stored on a dynamic dashboard which helps to improve programmatic decision-making. Nigeria, Nepal, and Pakistan) as it is able to deliver content to achieve both educational and counseling objectives to frontline workers. The Roshan Mustaqbil Application for Pakistan added value to the existing platform in that it was designed to a serve a dual purpose: mLearning (self-learning) and mCounseling (client counseling) on maternal and child health. mCounseling (digitized version of the Roshan Mustaqbil IPC Toolkit) combines the three-step IPC approach (Listen, Understand, Jointly Problem Solve) endorsed by the LHW Programme, with interactive audiovisual materials on maternal child health. The self-learning component applied adult learning theories to develop a learning pathway for Pakistani Lady Health Workers. Through mLearning, LHWs also benefit from engaging entertainment-education videos, quizzes and other educational resources designed to encourage introspection and skills-building. HCC recommended that the Sindh government and Sindh Lady Health Worker Programme in Pakistan continue to invest in proven methods of LHW capacity building, such as the newly developed mHealth application. This recommendation stems from HCC’s initial assessment findings which supported the use of Roshan Mustaqbil mHealth Application for over 80 LHWs residing in the Sindhi Province. 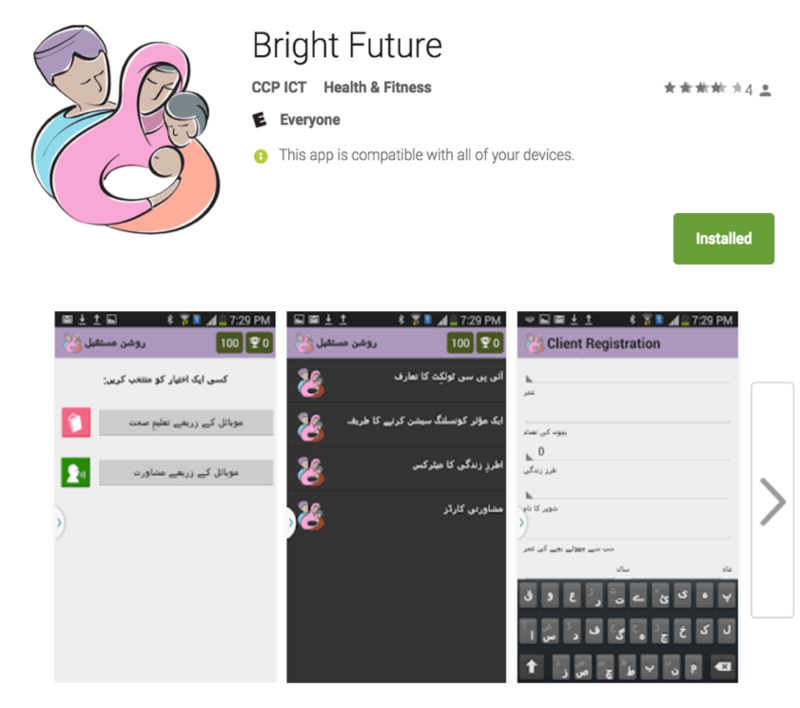 Given the increasing population and growing need for high functioning LHWs in Sindh, the Roshan Mustaqbil mHealth Application is a singular opportunity to build on a proven mHealth tool that has already enhanced the interpersonal communication skills and improved the efficiency of LHWs in Sindh Province.